Alluvial Fund commentary for the third quarter ended September 30, 2018. For the quarter just ended, Alluvial Fund returned 3.2% compared to 7.7% for the S&P 500 Index and 3.5% for the Russell 2000 Index. Through the end of September, Alluvial Fund was up 5.2% compared to 10.6% for the S&P 500 Index and 11.5% for the Russell 2000 Index. It is not my regular habit to comment on market moves beyond the scope of these quarterly retrospectives, but I feel partners deserve an update given October’s downdraft. As I write, the small-cap Russell 2000 Index is down 13.3% this month and the S&P 500 Index is down 9.1%. Alluvial Fund has declined approximately 6.5%. This pattern is much like past periods when Alluvial Fund’s collection of obscure and ignored securities provided some respite from weakness in the broader market. The possibility of further market declines or even an economic recession concerns me little. The Alluvial Fund portfolio is focused on high quality companies with secure revenue streams, low or no debt, and healthy cash flow. Excepting a few holdings with special circumstances, we have chosen to avoid deeply cyclical companies, those with onerous leverage, and those that do not produce free cash flow. This is not to say I am satisfied with losing money. Far from it! After all, the entireties of my personal and family funds are invested in Alluvial Fund. However, avoiding large losses when the market is trending downwards goes a long way toward achieving attractive returns in the long run. Despite this year’s subdued returns, our portfolio companies have enjoyed operational success. I am as confident as ever on the prospects of each company, yet aware that the market may or may not reward these successes in the short run. What follows is discussion of Alluvial Fund’s top holdings and this quarter’s winners and losers, as well as commentary on new opportunities and where I see value now. At a little less than 19% of the Alluvial Fund portfolio, rural telecommunications companies represent our largest industry exposure. Expect this state of affairs to remain until I find another group of companies with such attractive cash flow profiles, high revenue visibility, and low market expectations. Nuvera Communications completed the acquisition of Scott-Rice Telephone in July. This acquisition will add meaningfully to Nuvera’s cash flows and earnings. It may take a few quarters to optimize Scott-Rice’s operations and there will be some one-off expenses along the way, but I believe the combined entity will produce free cash flow of at least $2.50 per share in 2019. At a trading price of $18.15, I do not think the market has caught up to Nuvera’s new economics. The company will continue to secure its future by expanding its fiber network and offsetting declining traditional telecom services revenue with broadband revenue. Otelco continues to chip away at its debt load, creating room for growth investments or capital returns to shareholders. The company’s second quarter results showed excellent progress on cost control and finding new revenue sources. Over the next twelve months, the company should be able to reduce its debt by at least another $10 million. As the company continues to reduce its financial leverage, I believe the market will remove the “excessive leverage” stigma that Otelco has carried since exiting bankruptcy years ago. LICT Corporation reported a record third quarter. Excluding one-time gains, both traditional and non-regulated revenues grew at a healthy rate. The company’s financial position could not be stronger: LICT now has only $5 million in net debt against annual operating cash flow of over $50 million. The company would do shareholders a huge favor by levering up to buy another telco. I wish they would ask me for advice; I know one or two small telcos that would make excellent purchases for LICT! Some companies are over-looked by the market due to their complicated financial statements or because they are currently under-earning based on the assets they possess. Assuming competent management and a fundamentally viable business model, complicated balance sheets have a way of simplifying and under-earning companies often make progress toward their profit potential. Two of the best of these opportunities I have come across in the last five years are Syncora and MMA Capital Management. In July, Syncora closed on the sale of its toll road assets. Now there are signs that the company is close to settling its long-running litigation against Macquarie in a case involving those toll roads. Having largely dealt with its legacy insurance operations, the next phase of the firm’s existence will see management attempting to utilize the company’s substantial NOLs. Rules around ownership changes may forestall major progress on acquiring new businesses until late in 2019, but plenty of upside remains for the patient investor. I am happy to hold Syncora shares while they trade at a meaningful discount to adjusted book value, though I am less confident in Syncora management’s ability to execute an acquisition strategy. Depending on the direction of the company at that point (and on the share price, of course) Syncora may become a smaller holding or exit the portfolio entirely. MMA Capital Management has been a perennial holding in Alluvial’s strategies since I launched the firm nearly five years ago. 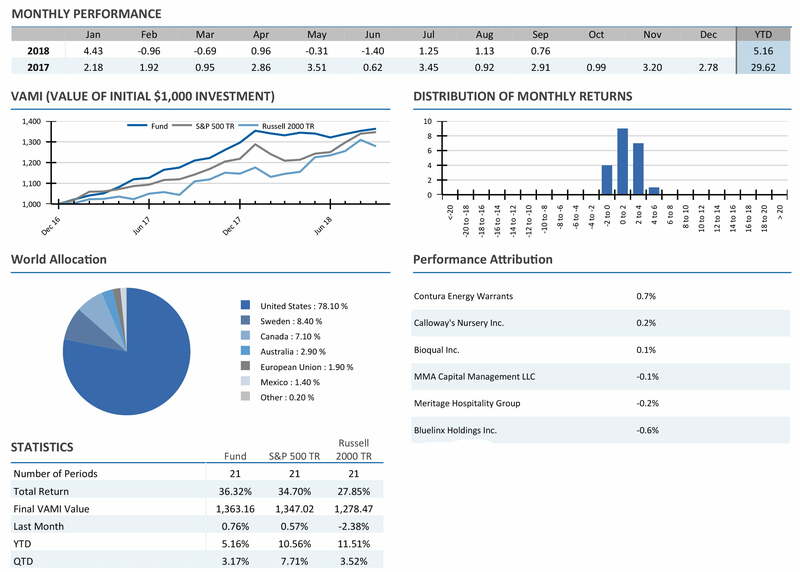 I added shares this quarter, bringing MMA’s weighting in Alluvial Fund to 7.5%. Despite several very positive developments and a continued buyback program, MMA now trades at its largest discount to book value of any point in the last five years. (For the record, this reported book value has been chronically under-stated and remains so, if not to the same degree as before.) The company does face some headwinds that may explain the widening discount. Investors are rightly anticipating higher interest expense and lower values for the company’s bond portfolio. However, higher interest rates will also increase the earnings from MMA’s book of solar construction loans. Others may turn a skeptical eye toward the company’s new external manager, Hunt. For its part, Hunt has every motivation to achieve a higher share price. Besides being a major investor in the company, raising equity capital and expanding MMA’s lending platform depends on closing the chasm between the share price and book value. 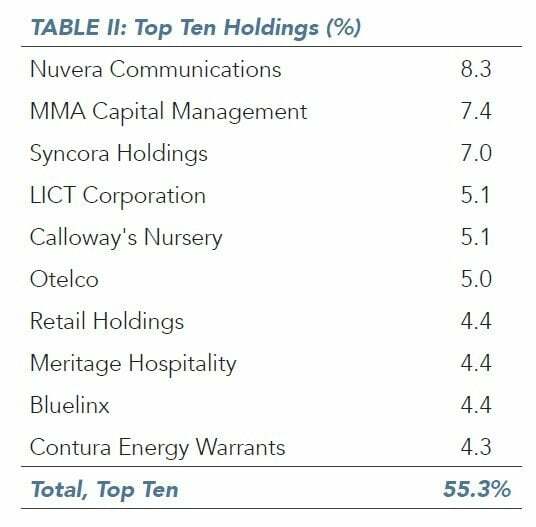 MMA has been an aggressive purchaser of its own shares for years, to the great benefit of its owners. I expect the company to complete its current buyback authorization and embark on a new repurchase program before year-end. The company is also taking steps to increase the investability of its shares, proposing a conversion to a regular C corporation. Doing so would allow the company to be included in certain market indexes. Contura Energy is illiquid, trades over-the-counter, and operates in a despised and misunderstood industry. While thermal usage coal is in terminal decline, the metallurgical coal that Contura produces will be needed for many years to come. Contura Energy is close to completing its merger with Alpha Natural Resources, creating the nation’s largest producer of high-quality metallurgical coal. In September, the companies announced a change to the merger agreement that will provide additional compensation to Alpha investors. The modified merger agreement is mildly dilutive to Contura’s value, but not enough to change the fundamental value proposition: Contura will continue to produce an extraordinary amount of cash and return it directly to shareholders. Current high metallurgical coal prices will not continue indefinitely. In the long run, high commodities prices always result in a flood of new supply, bringing the era of bumper profits to an end. That said, I believe there are good reasons these elevated metallurgical coal prices will stick around for longer than previous cycles. The dim future for the coal complex as a whole strongly discourages major capital expenditures on new mines. Marginal metallurgical coal production will come mostly from re-commissioning idled mines, not from brand new facilities. Rational management teams will be reluctant to incur the costs of re-commissioning higher-cost, lower-quality mines, not knowing if these mines will still be profitable in a few years’ time. The knowledge that global coal consumption will continue to trend downward strongly encourages miners to prioritize returning capital to shareholders over growth investments. These factors notwithstanding, metallurgical coal prices will eventually revert to long-term equilibrium prices. My valuation of Contura stock incorporates this reality. I expect Contura to return a large amount of cash flow to shareholders in 2019 via special dividends or tender offers. I also expect Contura stock to benefit from improved liquidity and index inclusion once its shares are listed on the NYSE. My job would be easier if everything I bought went no direction but up; clearly that’s not the case. This quarter’s finest example was BlueLinx. After hitting a high of $42 in early September, BlueLinx has posted a deep and steady decline to below the $22 mark, a decline of 51%. This collapse occurred on no meaningful company-specific news, only mounting fears of a coming slowdown in the housing and construction markets. As a result of its watershed acquisition of Cedar Creek, BlueLinx carries a large amount of debt. The company is working to reduce this debt in both relative and absolute terms, but for now, small changes in the perceived value of the enterprise will have an outsized effect on the value of BlueLinx’s equity. Is the market correct? Is the American housing market really poised for a terrible reckoning? Anything is possible, but I don’t think such a bearish outlook is justified. Many areas of the country are suffering housing shortages, and Americans my age and a little younger are entering their prime home-buying years. Even though higher interest rates are a headwind for housing starts, I think demographic forces are strong enough to sustain healthy rates of housing starts for years to come. A decade on from the last recession, private investment in residential real estate still has not returned to the long-term average, let alone exceeded it. Either Americans simply need fewer units of housing per person, or a large pool of deferred demand for new housing exists. I believe the second scenario is vastly more likely. My sense is investors still carry the scars of the Financial Crisis, when anything related to housing or financial services suffered terrible, often permanent losses. Investors may be dumping housing-related companies at the first sign of a slow-down for fear of repeating these losses. BlueLinx’s business appears robust in all scenarios except a severe housing market downturn combined with soaring interest rates. I will certainly be monitoring BlueLinx’s progress toward achieving the cost savings it projected when it bought Cedar Creek its progress toward dealing with its debt load. An ebullient residential construction market would certainly assist with those goals, but even a sluggish market should not keep the company from making progress toward increasing its earnings and deleveraging its balance sheet. Polaris Infrastructure dipped modestly this quarter following its losses of earlier this year. The situation in Nicaragua remains tense, with little progress toward bringing the Ortega government, protesters, and other stakeholders to the negotiating table. While the violence seems to have quieted down, it could easily flare up again at any time. Meanwhile, Polaris’ geothermal facility continues to generate clean power around the clock. The company has not reported any issues or interference with its operations. In fact, curious investors can check online and view the status of Polaris’s generating units any time at all. (Under “Postdespacho,” the Polaris units are “PEN3” and “PEN4.”) Polaris reported record second quarter results and 2019 free cash flow should exceed CAD 3 per share, after required debt amortization. The company has indicated it would like to purchase renewable energy assets in other jurisdictions to diversify its earnings base. I would rather the company repurchase shares or at least increase its dividend, but I understand the rationale behind the search for additional assets outside of Nicaragua. While the risk associated with Polaris Infrastructure has certainly increased since last year, the market’s reaction is excessive. Year-to-date, Polaris’s enterprise value has gone from to $340 million to $250 million even as the company completed a substantial growth capital expenditures program, reduced debt, and reported record production and earnings. A nearly 30% free cash flow yield is more than adequate compensation to take on the risk involved, especially when the Nicaraguan government has strong incentives not to interfere with Polaris’s operations or finances. Investors will likely have to wait until the political situation in Nicaragua shows signs of peaceful resolution for the shares to rise, but we are being extremely well compensated for our patience. A regulated utility trading at <9x trailing earnings with good potential for earnings growth. The company is conservatively financed and represents a defensive bargain. A real estate company with a trophy building in a densely populated, very high cost city. The look-through valuation of this building is 40% lower than comparable properties in similar markets and vastly below replacement value. The company also owns other valuable real estate. A transportation company at less than half of tangible book value and under 3x earnings. These earnings are sustainable and may increase as demand for the company’s assets improves from the current low level. Lately, I have been having fun looking into potential investments in the Baltic nations of Estonia, Latvia, and Lithuania. These are textbook neglected markets. 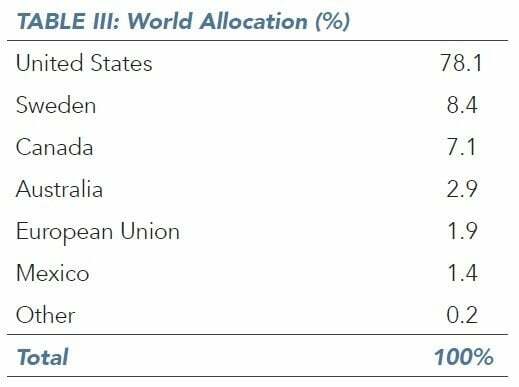 The collective market capitalization of all publicly traded Baltic companies is only a few billion dollars. The free float is substantially lower, because many Baltic companies are majority-owned by other European companies or by individuals and families. Investors perceive these economies as low-growth and burdened by aging populations and a potentially aggressive neighbor in the Russian Federation. That spells value. Even the best Baltic companies typically trade at single digit earnings multiples and at or below book value. I am enjoying investigating these companies one by one to determine if any deserve a spot in Alluvial Fund. On the domestic front, I still see opportunities in community banks. As recently as a year ago, it was still possible to buy good quality community banks at 80-90% of tangible book value or less. That opportunity is now in the rearview mirror. Now, however, interest rates have moved closer to long-term averages and most small banks trade above book value. The current market still provides chances to buy into high quality banking franchises at 8-12x earnings. These are good prices for banks with solid ROEs and the ability to expand their presence in their local markets. Of particular interest to me are banks with low cost deposit bases. These banks are sheltered from increases in short-term rates and may make attractive acquisitions for larger banks looking to decrease their cost of funding. We are closing in on two years of operations for Alluvial Fund. While I am happy with what we have achieved so far, I believe the best is yet to come. I am currently evaluating brokerage relationships that could expand our investable universe to new geographies and exchanges. My associate Tom and I have been working to increase our research capabilities and bandwidth. The goal is always to find the best opportunities around the world. I’ve always said the Alluvial investment process involves turning over a LOT of rocks. The more of these stones we can flip, the more bargains we may find amongst the obscure and the ignored. We are seeking more like-minded investors to join us as limited partners in Alluvial Fund. Qualified value investors with long-term outlooks, a tolerance for volatility, and an interest in accessing the forgotten corners of the market are ideal candidates. If you know anyone who fits the bill, we would welcome the referral! I am thrilled to announce the Alluvial family grew by two this quarter! Tom and his wife, Bailey, welcomed a son, Marcel, in August. Kayleigh and I welcomed a daughter, Tess, at the end of September. Everyone is doing very well. If you happen to be in the New York area next month, I hope you will join us on November 14 for a happy hour at Casa Nonna on West 38th Street. From 5:00 to 7:30p, Alluvial will present along with a few other fund managers that I know and respect. Tom and I will be around the whole evening if you can’t get there before 7:30p. All are welcome. Full details are here and RSVPs are appreciated. If you plan to attend, please e-mail Alluvial or Jessica Greer at jessica@willowoakfunds.com. As we move into peak earnings season for our portfolio companies, I am hopeful that the market will reward positive developments with higher share prices. However, I am mindful that market sentiment often outweighs fundamental developments in the short run. Should the market continue on a downward course, new investing opportunities will no doubt present themselves. I will do my best to take advantage of these opportunities. As always, I welcome your calls and e-mails. Please reach out with any questions on Alluvial Fund’s holdings or strategy, or just to catch up. I wish you and your family and happy and healthy season, and I look forward to reporting to you in early 2019.